Makes sure that your landing page is visually appealing and easy to understand. Use visual cues to draw attention to the areas that you want visitors to focus more on. Using the appropriate colors, text, images, and layout can drastically impact your number of conversions. As mentioned earlier the lead capture form can often make or break the landing page. Even if you followed the basic landing page tips a bad form can quickly turn your visitors away. The form itself it will depend on your company or the type of information that you require however every form should follow the guidelines below. Don’t make your potential customers scroll to find the form because you want them to see it as soon as the page loads. Your form should be positioned above the fold and close to your call to action. 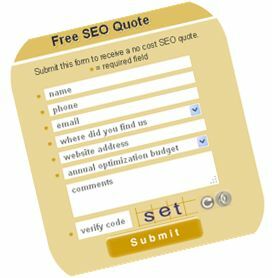 For example, your call to action might be a graphic in the center of your page that says “Request a Free Quote”, it should be either next to or pointing to the form to signify to visitors that they must first fill in the form before asking for the free quote. The length of your form will be a direct result of how much information you need to collect. Simple “Sign up to receive our newsletter” forms can consist of only a few text fields where as a “Request a free mortgage quote” form may require a lot more text fields. A shorter form will result in more submissions where as a longer form will result in fewer submissions. However even though you get fewer submissions a longer lead form will usually produce higher quality leads. Try to keep the form short enough so that people don’t have to scroll to continue filling in boxes because this will discourage them from continuing. What information do you need to collect? Request the necessary information and avoid asking for details that you don’t really need. Remember that once they become a client you’ll have the opportunity to gather more information. Make sure that you have a Name and an email field so that you can do a follow up with the person. Besides those two fields the rest will all depend on the type of business or website that you have. Also identify with your visitors which fields are required and which ones are optional. Be sure to make your forms character specific so that letters can only be entered into word fields and numbers only in number fields. Also make your forms simple to tab through or automatically move to the next field once the information is entered. It is also helpful to use drop down menus for the fields that have a wide range of options such as what state the visitor is located in. The word “submit” can often produce a bad response when people are providing their information because it seems final and unchangeable. Instead try using words like “click to continue”, “get started”, “go”, or “Request”. Use what works best with the type of product or service that you offer. If don’t already have a landing page with a lead capture form on it or you have one that isn’t quite up to par with these suggestions, give them a try and hopefully you will be able to see a difference with acquiring more leads. If you are unfamiliar with landing pages we have discussed them before in a past blog article from CDTek.com. Visit Creating an Effective Landing Page and Getting the Conversion to learn more about making a successful landing page and why it is important to do so. 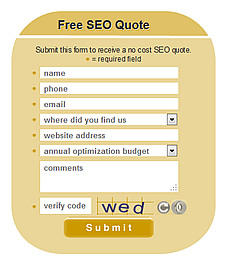 This entry was posted on Friday, November 4th, 2011 at 12:26 pm	and is filed under Internet Marketing, Web Development. You can follow any responses to this entry through the RSS 2.0 feed. You can leave a response, or trackback from your own site.